NLDR (pronounced “Noodler”) from Conductive Labs is quite a sequencer, if it can be called that at all. If I had to summarize what makes it different, whereas with a typical sequencer, you enter notes to express your ideas – with NDLR you provide the musical ideas, and it takes care of the notes for you. By “musical ideas” I mean a key, a scale, a live or programmed chord sequences, and “motifs” – which are a combination of note interval patterns and the rhythm with which they’re played. Of course, the biggest question is – what are the trade-offs? What are you giving up by handing over partial control of your music to NDLR? NDLR performs your ideas using three part types: Drone, Pad and Motif (NDLR has two Motif parts, but they both behave the same way). 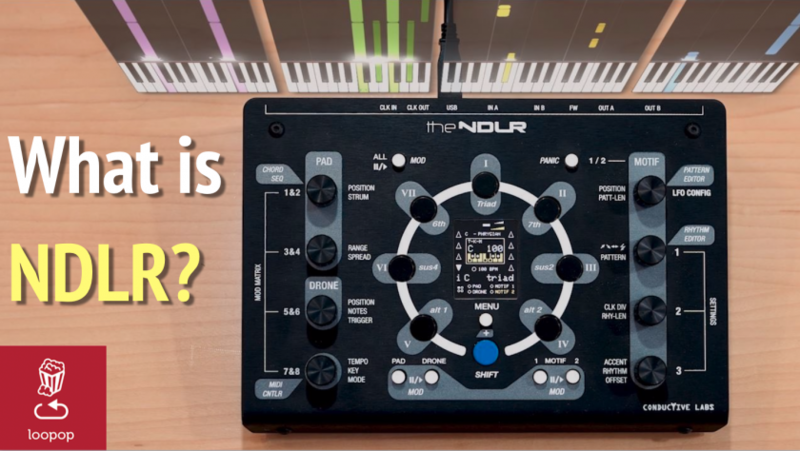 All of these parts conform to the selected key and scale, and NDLR can also take any incoming MIDI and conform that as well – so you could view that as another type of part. The Pad and Motif parts are particularly interesting. Pads automatically take care of chord inversions for you, so that chords you play don’t have a “transposed” feel, and they can play close to two dozen notes simultaneously across four instruments. They also have a few interesting modes that thin out note density on the bottom end, and strum notes at various tempo-synced rates. Motifs are also quite special, in two ways. First, they separate the notes you play from the groove or rhythm with which they’re played. Second, note patterns in Motifs can be programmed chord note intervals rather than just chromatically or by scale like typical sequencers. NDLR also has an 8 slot mod matrix. Mod sources include 3 LFOs, a few preset mod sources and several expression inputs serving as mod sources. Modulation destinations are plentiful, including most of NDLRs parameters. Check out the video above for substantially more detail, in depth demo, and pros and cons.